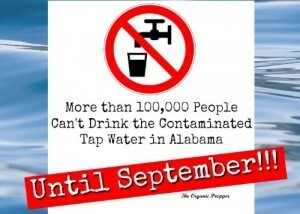 More than 100,000 People Can’t Drink the Contaminated Tap Water in Alabama…Until September! It really seems as though issues with municipal water supplies are occurring more frequently. More than 100,000 residents have been told that they can’t drink or cook with the contaminated tap water in Alabama by the West Morgan-East Lawrence Water Authority…but this isn’t just a week-long clean-up. The restriction is expected to last until September. The issue is synthetic chemicals that have the potential to cause cancer, birth defects, and developmental delays in children. Traces of PFOS (Perfluorooctane sulfonate) and PFOA (perfluorooctanoic acid) were found in the blood of nearly every single person tested, according to the EPA. This is a contaminant I covered in my book, The Prepper’s Water Survival Guide when I wrote about the fact that some suspected toxins in municipal water supplies are not actually regulated. The EPA has drinking water regulations for more than 90 contaminants. Currently, the agency is monitoring 30 contaminants that presently are not regulated, 28 of which are chemicals and two of which are viruses. In late 2013, researchers from the US Geological Survey and the Environmental Protection Agency analyzed single samples of untreated and treated water from 25 US utilities that voluntarily participated in the project. They found traces of 18 unregulated chemicals, including 11 perfluorinated compounds, an herbicide, two solvents, caffeine, an antibacterial compound, a metal, and an antidepressant. The researchers said the concentrations were generally low, but for many of the contaminants, little is known about potential health risks. But one of the perfluorinated compounds, known as PFOA, has been linked to a variety of health problems, including cancer among people in communities where water is contaminated by a chemical plant in West Virginia. PFOA has been detected in the blood of nearly all people in the US. Even more disturbing? A panel of scientists has concluded that there is a “probable link” between PFOA in drinking water and high cholesterol, ulcerative colitis, thyroid disease, testicular cancer, kidney cancer, and pregnancy-induced hypertension. The findings were based on people in Mid-Ohio Valley communities whose water was polluted with PFOA from a DuPont plant. The water authority blames 3M for the contaminated tap water in Alabama. Let the finger-pointing and buck-passing begin. Last year, the water authority filed a suit against “3M and other companies” over the contamination in the river. If I’m understanding that correctly (and I’m pretty sure I am) that means they were aware of this issue long before the advisory was issued on May 19. So, much like the Flint scandal, those in the know were aware that customers (who pay for water) were drinking cancer-water. 3M, however, says not to worry. You’ll be fine. “Attorney William Brewer, who represents 3M in the matter, said via email that the company has followed the law and disputed the claims that the substances are harmful. 3M stopped manufacturing both chemicals more than a decade ago, yet the substances remain in the water at elevated levels. Environmental group Tennessee Riverkeeper filed a notice of intent to sue 3M last year over contamination of the river. Dr. Carol Ley, 3M vice president and corporate medical director, said the company has not found evidence of negative health impacts among its own workers, who were exposed to the chemicals for long periods of time. Oh. Well, gee. In that case, folks can just guzzle away. I’m sure 3M will take responsibility if they get cancer from excess levels of PFOS and PFOA, right? You can’t boil away or filter away this type of contamination. The thing with chemical contamination is that the water simply can’t be purified. Boiling it, in many cases, simply intensifies the strength of the toxins. Filtering it does nothing to remove the chemicals. (Although I have high hopes for this water filter that was the only one I’m aware of that made the water in West Virgina and Toledo safe to drink. They’re currently running tests with these particular chemicals and I’ll let you know the resulst as soon as I know.) That’s the case in this northern Alabama community. According to an RT report, WMEL general manager Don Sims gave a press conference. “I recommend that all our customers do not drink our water, until we are able to bring the temporary system our engineer is designing online,” Sims said at a news conference. The warning covers not only fresh water, but even water boiled and filtered at home, since neither method can remove the chemical contaminants. After building up in people and animals over time, PFOS and PFOA can also cause liver and thyroid damage, as well as immune system problems, with small children and expectant women the two categories most at risk. The company is hard at work, engineering a temporary system to the tune of $4 million. The system is “a granular activated carbon system that forces water through six box-car sized filters before sending it on to customers.” The permanent system won’t be ready until 2019 and will cost somewhere between $30 million and $50 million. So not only will people be scrambling to afford to buy bottled water, with this much need for it, they’ll probably have to drive elsewhere to acquire it. If you’ve ever been on a really tight budget, you know that an unexpected expense like that can be crippling. Are you testing your own tap water? YOU WILL BE THE LAST TO KNOW. Here’s another quick excerpt from The Prepper’s Water Survival Guide about water testing. Even if you are getting presumably safe “city water” from a municipal supply, you should be provided with an annual report that explains what kind of testing was done on your water and what was found, if anything. Of course, if you aren’t the trusting type, you can still test that water yourself as an added precaution. If you have a well or are collecting water from a source that is not monitored and regulated, you will need to take responsibility for testing and purifying your water yourself. Studies have shown that around 50 percent of private water systems fail at least one drinking water standard. Many common pollutants do not cause water to smell, taste, or look funny, so you can’t rely on your senses to determine safety. Water is a “universal solvent,” meaning that it has the ability to dissolve almost anything it comes into contact with. This characteristic means that it is very easily contaminated. Most testing isn’t expensive, and the time and financial investment will provide you with priceless peace of mind. Not only is your family’s health at stake, there are possible legal consequences involved. Think about how litigious our society is: If someone consumes your water and becomes ill, you’ll want to be able to prove that you conducted the proper testing on a regular basis. And, should you suspect your water supply has become contaminated by an outside source, you’ll want to have documentation to support your case. You can test your water yourself or have a professional lab or service do it for you. Drinking water quality test kits are available for purchase online and at most superstores and home improvement stores. Basic kits usually test for bacteria, lead, nitrates/nitrites, pesticides, chlorine, hardness, and pH. They are fast, simple to use, and inexpensive. Your test kit will have instructions specific to that kit. Kits that test for less-common contaminants are also available. Some test for 15 or more contaminants, including the ones in the basic testing kits, plus iron, sulfate, copper, and sulfide. Even more in-depth testing kits are available, but most of them require you to send your samples to a professional lab. Most of them check your water for around 100 different contaminants, including volatile organic compounds, toxic metals, heavy metals, and bacteria. The pricing for these comprehensive kits is typically in the $100 range, and results can take about a week to receive. The Watersafe Well Water Test Kit was specifically designed to help you test quickly and easily for the 10 most common contaminants found in private wellwater, including: iron, copper, lead, bacteria, pesticides, nitrates, nitrites, chlorine,pH and hardness. The PurTest Home Water Analysis kit is a comprehensive EPA-based test kit that allows you to quickly and easily test your drinking water for various contaminants and conditions. Tests included: 1 test each for bacteria, lead, & pesticide. Two (2) tests each for iron, alkalinity, pH, hardness, chlorine, copper, nitrate & nitrite. The Essential Indicators test is the most thorough, but you have to send the water to their lab to get the results. The test checks for 170 health-related contaminants including Volatile Organic Compounds, Essential Elements, Heavy Metals and Inorganic Chemicals. You simply fill the bottles with your tap water and return them to our lab using the same box you received with the test kit. Within about 6 business days you will receive an email containing the results of your water test along with recommended treatment suggestions if a problem was found. The one family of contaminants that you will test for yourself are pathogenic bacteria, which, if present, can cause infectious diseases. You are ultimately responsible for the health and safety of your family. Let me repeat: You’re going to be the last one to know. In the current case of contaminated tap water in Alabama, it’s obvious by the legal action taken by the water authority against 3M that they’ve known this was an issue since last year. And yet, somehow, the advisory has long just been issued, halfway through 2016. In the current case of contaminated tap water in Alabama, it’s obvious by the legal action taken by the water authority against 3M that they’ve known this was an issue since last year. And yet, somehow, the advisory has long just been issued, halfway through 2016. We saw the same thing happen in the Flint, Michigan crisis, where it’s suspected that the EPA, the governor of the state, and assorted other “officials” were aware of the high levels of lead in the municipal water supply. And you’re also responsible for having the means to keep your family healthy. That means, you absolutely must store water. You must have a way to purify safe sources of water. And, lastly, you must educate yourself on how and when to do these things. When I was researching The Prepper’s Water Survival Guide, I was blown away by the things I learned about the contaminants in our water every single day. Before that, I didn’t test my own water. I stored some water, but felt that most things could be filtered out by a high-quality system. But that’s the natural stuff. You can’t purify water of many of these chemicals, and it’s important to learn the difference. This is precisely why preppers talk about long-term water emergencies, and it’s such a realistic scenario that I wrote an entire book on the topic. It isn’t a far-fetched apocalyptic fantasy. It’s something that can (and does) happen, right here in America, without any type of warning. It’s a life-changing, even life-threatening, situation, but you can get ahead of it. You can prepare for these emergencies that are becoming more and more frequent. How are your water preps coming along? In a new paper just out in the open-access journal Environmental Research Letters, sociologist Mary Collins of the State University of New York College of Environmental Science and Forestry and two colleagues from the National Socio-Environmental Synthesis Center and the University of Maryland examined what they term “hyper-polluters”: Industrial facilities that, based on EPA data, generate disproportionately large amounts of air pollution. Then, they cross-referenced the location of these facilities with socio-demographic data from the 2000 census. The result? “We find striking evidence that extreme emitters are likely impacting EJ [environmental justice] communities even more significantly than typical EJ scholarship might predict,” the study said. The study adds to a body of evidence showing that the U.S. continues to struggle when it comes to “environmental justice,” a concept advanced by advocates and researchers to describe the reality that poor and minority communities tend to have disproportionate exposures to environmental hazards. The industrial emissions examined in the new study were reported by close to 16,000 industrial facilities in the continental U.S. as part of the EPA’s toxics release inventory program. The facilities were across a variety of sectors, ranging from mining to manufacturing, according to Collins. They did not include large power plants. Examining this EPA data, the study found a significant disparity when it comes to how much different facilities pollute. “90% of toxic concentration present in the study area is generated by only 809 (about 5%) of facilities,” the paper reported. But what was particularly striking was cross-referencing this information with socio-economic data on the people living around the facilities, based on a nationally representative sampling of Census information. The highest polluting facilities were also more likely to be located in proximity to poor and minority neighborhoods. The work is an advance in the environmental justice field, using big data approaches to underscore a familiar conclusion in a new way, says Andrew Jorgenson, an environmental sociology professor at Boston College who was not involved in the study. “The substantive argument is something that’s been around a long time, but this is a very sort of sophisticated, methodologically rigorous, and far reaching analysis that provides some generalizable analysis of this occurring across different regions,” Jorgenson says. Wilson said that because of this, the new research could help EPA engage in targeted, voluntary programs to help these facilities lessen their emissions, and get a bigger impact than might happen by trying to work industry-wide or nationwide. The immediate problem in Flint wasn’t about air pollution of the type involved in this study. 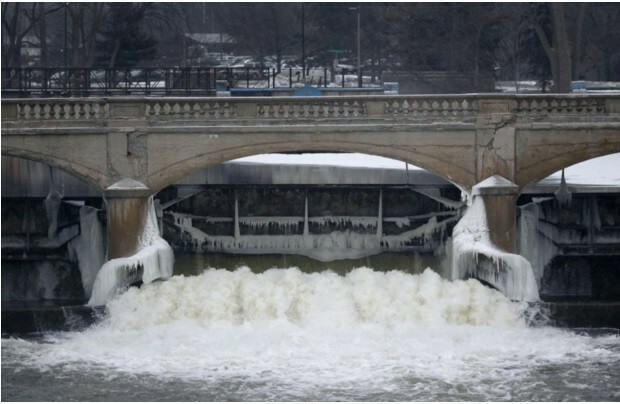 Rather, it turned on a decision to switch the city’s water supply from Detroit’s to the Flint River to reduce costs. Still, it’s relevant, say Wilson and Jorgenson. “Flint falls into this broad category, a community that is sort of structurally disadvantaged,” Jorgenson says. “I think what you see in Flint is really going to raise attention around environmental justice issues around the country, and also how you have these other environmental justice disasters that are looming out there,” adds Wilson.